We love hearing from our readers who are across the ocean! This creative diaper cake creation comes directly from Irene in Italia. Bellisima! Our readers have put their heart and soul into these diaper cake creations and then they share them with us! We have the best readers in the world who are paying it forward, year after year, to help the rest of us. And Irene from Napoli is one of them! 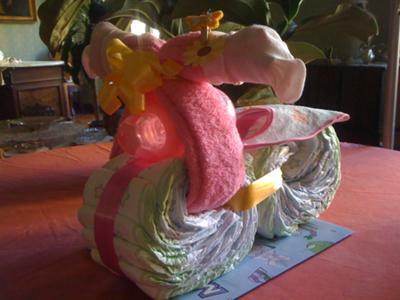 Her diaper cake bike is SO creative and so cute! Irene, grazie! Ben Fatto!